Too Many Plastic Bags? We Can Help! If you are like so many, you have a secret cupboard that is full of various plastic bags accumulated over time. For many, it can become a problem when it gets so full you can’t put one more bag in without 5 or 6 falling out! Even plastic bag caddies can only hold so many. Don’t feel bad, you are not alone. Despite plastic bag bans, the average household still seems to accumulate more plastic bags than can be reused. All plastic bags have value in the recycling market, even though some jurisdictions are not equipped to recycle them through their local blue box program. TWD can help. Gather all your bags and stuff them all into one big bag, then toss it into any bin we service. 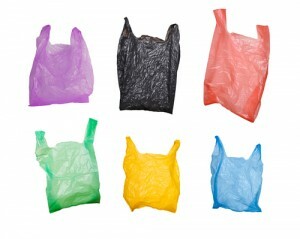 We sell these bulk bags to a 3rd party recycler, maximizing our charity clients’ ability to fundraise through recycling. We can recycle any plastic bag, but know that for fundraising purposes, clear bags, even if they have a bit of writing on them, hold the most value. Aside from plastic bags, regular textile bags, purses, shoes and boots also help our clients maximize their fundraising potential. TWD is in the early stages of a major renovation. We are retrofitting our Mississauga location to accommodate the sorting of recyclables that we collect that are not textile. Despite clear signage on our bins to only donate textile waste, we find that often miscellaneous items are also included. This at one time was a costly liability, but with efficient waste management, we are making changes that will turn it into an added revenue stream, further maximizing our clients’ fundraising potential. < Reuse, Re-Sell, or Simply Dump?